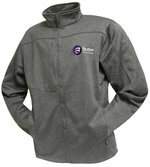 Dark heather gray full zip jacket, side pockets, upper left chest zippered pocket and inside pocket. 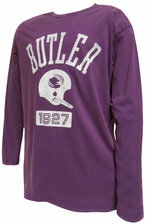 "Butler Community College" embroidered in white on the upper left front with the college "B" embroidered in purple & white. Black thermal fleece lining. 100 % polyester. 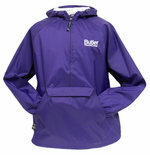 Purple hooded 1/2 zip lined pullover jacket with pouch, "Butler Community College" embroidered in white on the upper left front. White lining, drawstrings at the hood and hem, elasticized cuffs, packs into its own pouch pocket. Outer shell 100% nylon, lining 100% cotton. 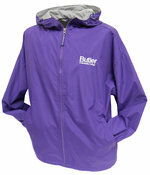 Purple full zip hooded jacket with heather gray lining, "Butler Community College" embroidered on the upper left front in white. Outer shell 100% polyester, lining 65% polyester 35% cotton. Dark charcoal gray hooded waterproof jacket "Butler Grizzlies" and the Grizzly Powerhead embroidered on the upper left front. Waterproof, lightweight, velcro at the end of the sleeves, adjustable elastic bottom, two side zipper pockets, one interior pocket, folds into a small pouch (included) for easy carry. Exterior 90% polyester 10% spandex, lining 100% polyester. Great jacket for cool/rainy weather. 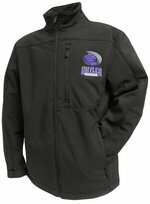 Black collared jacket "Gutler Grizzlies" and the Grizzly Powerhead embroidered on the upper front. Two side zip pockets and upper left front zip pocket, water resistant, breathable, light weight, 4-way stretch, soft shell, lined. Velcro straps on the sleeves and adjustable elastic around the bottom. Exterior front 92% polyester 8% elastane; back and lining 100% polyester.